Imagine yourself standing at the edge of one of Iceland’s beautiful lagoons. 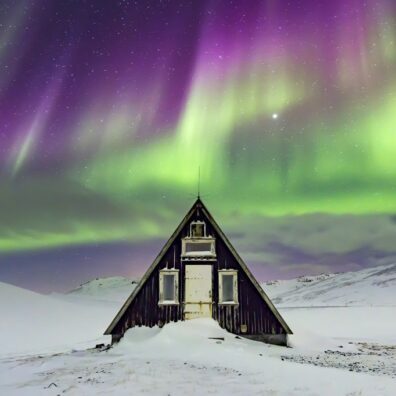 The sun has long set, the stars are glistening, and as we look over the calm, reflective, icy water, we catch our first glimpse of the luminous greens and purples as the northern lights (aurora borealis) begin to mysteriously appear against the jet black sky. I can still vividly recall how I felt the moment I first experienced this natural phenomenon as the initial glow intensified into a full blown, colourful light show above me. This is a memory I will cherish for the rest of my life. The beauty of being a landscape photographer is that I also have the photographs to look back on. Of course Iceland has so much more to offer than just the northern lights and no visit would be complete without experiencing the world famous Jökulsárlón beach. What makes this location so amazing is the contrast between the crystal clear icebergs and the black, volcanic sand. As landscape photographers, we are constantly trying to create unique images and what I love about this location is the way that it allows you to capture photographs which can never be recreated. Iceland as a country offers so many of these opportunities. 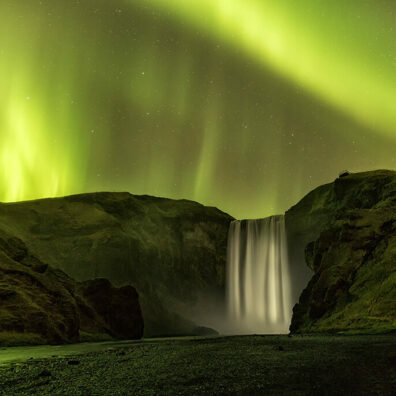 If you have never experienced what it feels like to stand at the base of a glacier fed waterfall, then a trip to Skógafoss is an experience not to be missed. The sound as huge volumes of water plummet 200ft into the Skógá River below is deafening and when combined with the icy cold spray against your face, the feeling is completely invigorating. This waterfall along with many others in Iceland such as Brúarfoss, Gullfoss, Oxifoss, and Seljalandsfoss offer great compositions and the opportunity to shoot long exposure images. Known as the land of fire and ice, Iceland was sculpted by a combination of volcanic activity, the weather and of course the ocean. At Vik and Reykjanestá we will photograph the impressive sea stacks surrounded by huge crashing waves. Using various techniques, including ND graduated filters, 10 stop filters and telephoto lenses, we will capture the power and drama of the Atlantic ocean in all its glory. Southern Iceland is known for its iconic viewpoints, but it is the fleeting moments of amazing light that define this island. The sight as a herd of wild reindeer wander across the icy barren wilderness, or a small red and white wooden church set against the backdrop of a huge mountain are the kind of scenes we will strive to capture. The primary reason for choosing to run my Southern Iceland landscape photography workshop in March is due to the beautiful soft, low light that you only get at this time of year. Sunrise and sunset times are also very reasonable during the winter months. During your photography workshop in Southern Iceland, you will have a professional landscape photography tutor available to assist you. I will be on hand to help you with all aspects of your photography, covering everything from camera technique and using filters right through to the finer elements of how to see a scene and composition. Depending on the time of the year we will be visiting Iceland (either March or October) we will be travelling in either the latest winter equipped, specialised 4×4 vehicles complete with a sizeable roof box for additional storage or a minibus/large people carrier (depends on the weather). In order to get the most out of Southern Iceland, will be staying at various hotels which are strategically located to minimise travel time. Unlike some workshops available, you will not be sharing a hotel room as we believe that it is important that you have your own space to fully relax at the end of the day and get a good night’s sleep. As we have already touched on, Iceland can be a challenging place to photograph due the ever changing weather conditions, however we are not embarking on an arctic expedition. This workshop aims to provide a fun-filled, hugely memorable experience where people with a passion for landscape photography can capture images of a lifetime whilst having a great time.